Uncover fundamental leadership and communication skills for project managers. 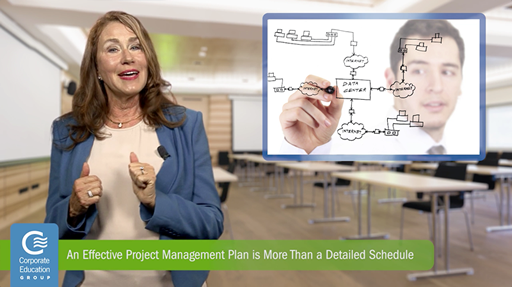 A project management plan is more than just a schedule that details how and when things get done. An effective project management plan should include how your project will be executed, monitored, controlled and closed. Overall, it must have enough detail to ensure the integration and coordination of all project activities. Now I know this list may seem overwhelming, but fleshing out these details will prevent your project from derailing later on. A great starting point is to establish a basis for measuring project performance. This will enable you to see if your project is successfully meeting its goals. Identifying scope, time and cost baselines is also crucial since you will need these to determine exactly how much time, money and resources are needed for the project. Also, identify which subsidiary plans are necessary for your project early on. Most projects require subsidiary plans to prepare for managing factors such as cost, stakeholder identification and communication, risk, change and more. The Project Management Institute’s A Guide to the Project Management Body of Knowledge, also known as the PMBOK® Guide, is an excellent reference to assist in this step. And remember, while it might be tempting to rely on a project management software program to create your plan, it should not be your first stop. These tools are very powerful, but knowing every detail of your project management plan before powering up your software is key. You need to know what you want to the tool to do for you before you start using it!